Pranidhi scene, temple 9 (Cave 20), with kneeling figures praying in front of the Buddha who Albert von Le Coq assumed were Persian people (German: "Perser"), noting their Caucasian features and green eyes, as well as the donkey and Central-Asian Bactrian camel loaded with tributary goods. However, modern scholarship has identified praṇidhi scenes of the same temple (No. 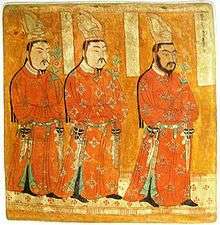 9) as depicting ethnic Sogdians, an Eastern Iranian people who inhabited Turfan as an ethnic minority community during the phases of Tang Chinese (7th-8th century) and Uyghur rule (9th-13th century). There are 77 rock-cut caves at the site. Most have rectangular spaces with rounded arch ceilings often divided into four sections, each with a mural of the Buddha. The effect is of entire ceiling covers with hundreds of Buddha murals. Some murals show a large Buddha surrounded by other figures, including Turks, Indians and Europeans. The quality of the murals vary with some being artistically naive while others are masterpieces of religious art. The murals that best represent the Bezeklik Thousand Buddha Caves are the large-sized murals, which were given the name the "Praņidhi Scene", paintings depicting Sakyamuni’s "promise" or "praņidhi" from his past life. Professor James A. Millward described the original Uyghurs as physically Mongoloid, giving as an example the images in Bezeklik at temple 9 of the Uyghur patrons, until they began to mix with the Tarim Basin's original Indo-European Tocharian inhabitants. 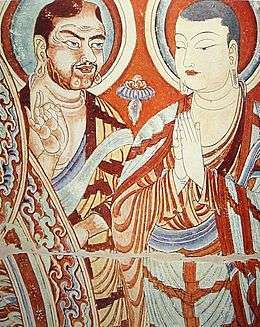 Buddhist Uyghurs created the Bezeklik murals. However, Peter B. Golden writes that the Uyghurs not only adopted the writing system and religious faiths of the Indo-European Sogdians, such as Manichaeism, Buddhism, and Christianity, but also looked to the Sogdians as "mentors" while gradually replacing them in their roles as Silk Road traders and purveyors of culture. Indeed, Sogdians wearing silk robes are seen in the praṇidhi scenes of Bezeklik murals, particularly Scene 6 from Temple 9 showing Sogdian donors to the Buddha. The paintings of Bezeklik, while having a small amount of Indian influence, is primarily influenced by Chinese and Iranian styles, particularly Sasanian Persian landscape painting. Albert von Le Coq was the first to study the murals and published his findings in 1913. He noted how in Scene 14 from Temple 9 one of the Caucasian-looking figures with green eyes, wearing a green fur-trimmed coat and presenting a bowl with what he assumed were bags of gold dust, wore a hat that he found reminiscent of the headgear of Sasanian Persian princes. The Buddhist Uyghurs of the Kingdom of Qocho and Turfan were converted to Islam by conquest during a ghazat (holy war) at the hands of the Muslim Chagatai Khanate ruler Khizr Khoja (r. 1389-1399). Anti portrait Muslims had Buddhist portraits obliterated during the wars over hundreds of years in which Buddhism was replaced by Islam. Cherrypicking of history of Xinjiang with the intention of projecting an image of irreligiousity or piousness of Islam in Uyghur culture has been done by people with agendas. Michael Dillon wrote that the 1000s-1100s Islam-Buddhist war are still recalled in the forms of the Khotan Imam Asim Sufi shrine celebration and other Sufi holy site celebrations. Bezeklik's Thousand Buddha Caves are an example of the religiously motivated vandalism against portraits of religious and human figures. The murals at Bezeklik have suffered considerable damage. Many of the murals were damaged by local Muslim population whose religion proscribed figurative images of sentient beings, the eyes and mouths in particular were often gouged out. Pieces of murals were also broken off for use as fertilizer by the locals. During the late nineteen and early twentieth century, European and Japanese explorers found intact murals buried in sand, and many were removed and dispersed around the world. Some of the best preserved murals were removed by German explorer Albert von Le Coq and sent to Germany. Large pieces such as those showing Praņidhi scene were permanently fixed to walls in Museum of Ethnology in Berlin. During the Second World War they could not be removed for safekeeping, and were thus destroyed when the museum was caught in the bombing of Berlin by the Allies. Other pieces may now be found in various museums around the world, such as the Hermitage Museum in St. Petersburg, Tokyo National Museum in Japan, the British Museum in London, and the national museums of Korea and India. 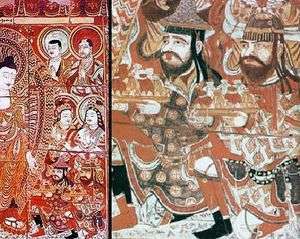 A digital recreation of the Bezeklik murals removed by explorers was shown in Japan. Uyghur Princes wearing robes and headgears, cave 9. ^ Cite error: The named reference gasparini_2014_pp134-163 was invoked but never defined (see the help page). ↑ "Bizaklik Thousand Buddha Caves". travelchinaguide.com. Retrieved 2007-09-21. ↑ von Le Coq, Albert. (1913). Chotscho: Facsimile-Wiedergaben der Wichtigeren Funde der Ersten Königlich Preussischen Expedition nach Turfan in Ost-Turkistan. Berlin: Dietrich Reimer (Ernst Vohsen), im Auftrage der Gernalverwaltung der Königlichen Museen aus Mitteln des Baessler-Institutes, p. 28, Tafel 20. (Accessed 3 September 2016). ↑ "Bizaklik Thousand Buddha Caves". showcaves.com. Retrieved 2007-09-21. ↑ Millward, James A. (2007). Eurasian Crossroads: A History of Xinjiang (illustrated ed.). Columbia University Press. p. 43. ISBN 0231139241. Retrieved 10 March 2014. ↑ Modern Chinese Religion I (2 vol.set): Song-Liao-Jin-Yuan (960-1368 AD). BRILL. 8 December 2014. pp. 895–. ISBN 978-90-04-27164-7. ↑ Peter B. Golden (2011), Central Asia in World History, Oxford: Oxford University Press, p. 47, ISBN 978-0-19-515947-9. ↑ Sims, Eleanor, Boris I. Marshak, Ernst J. Grube, (2002), Peerless Images: Persian Painting and Its Sources, New Haven and London: Yale University Press, p. 154, ISBN 0-300-09038-2. ↑ von Le Coq, Albert. (1913). Chotscho: Facsimile-Wiedergaben der Wichtigeren Funde der Ersten Königlich Preussischen Expedition nach Turfan in Ost-Turkistan. Berlin: Dietrich Reimer (Ernst Vohsen), im Auftrage der Gernalverwaltung der Königlichen Museen aus Mitteln des Baessler-Institutes, p. 28. (Accessed 3 September 2016). ↑ Michael Dillon (1 August 2014). 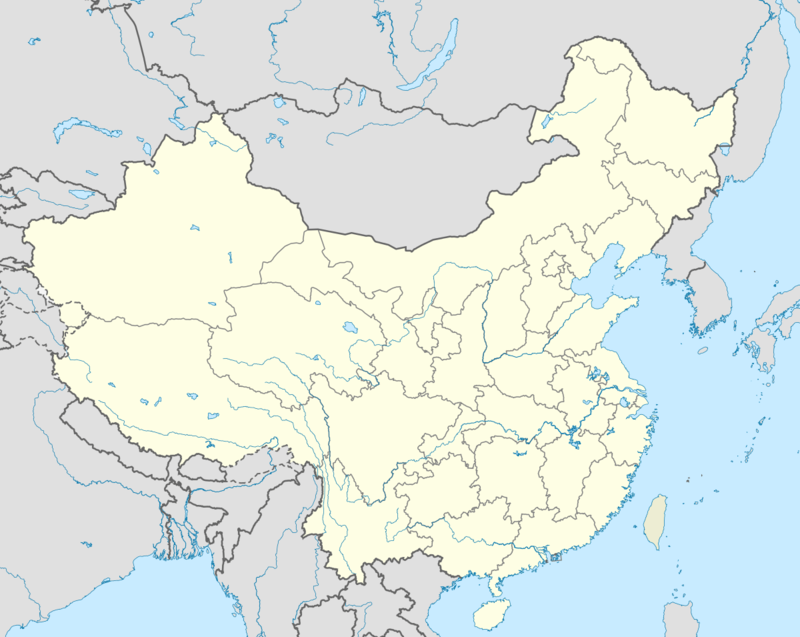 Xinjiang and the Expansion of Chinese Communist Power: Kashgar in the Early Twentieth Century. Routledge. pp. 4–. ISBN 978-1-317-64721-8. ↑ Michael Dillon (1 August 2014). Xinjiang and the Expansion of Chinese Communist Power: Kashgar in the Early Twentieth Century. Routledge. pp. 17–. ISBN 978-1-317-64721-8. 1 2 Whitfield, Susan (2010). "A place of safekeeping? The vicissitudes of the Bezeklik murals". In Agnew, Neville. Conservation of ancient sites on the Silk Road: proceedings of the second International Conference on the Conservation of Grotto Sites, Mogao Grottoes, Dunhuang, People's Republic of China (PDF). Getty Publications. pp. 95–106. ISBN 978-1-60606-013-1. Polichetti, Massimiliano A.. 1999. “A Short Consideration Regarding Christian Elements in a Ninth Century Buddhist Wall-fainting from Bezeklik”. The Tibet Journal 24 (2). Library of Tibetan Works and Archives: 101–7. http://www.jstor.org/stable/43302426. Wikimedia Commons has media related to Bezeklik caves.